Today is a wonderful day because it’s the first time I cooked in my new kitchen !! So because it was going to be my first meal in my new kitchen I was feeling very nostalgic and decided to make the first vegan meal that I ever learnt to make. 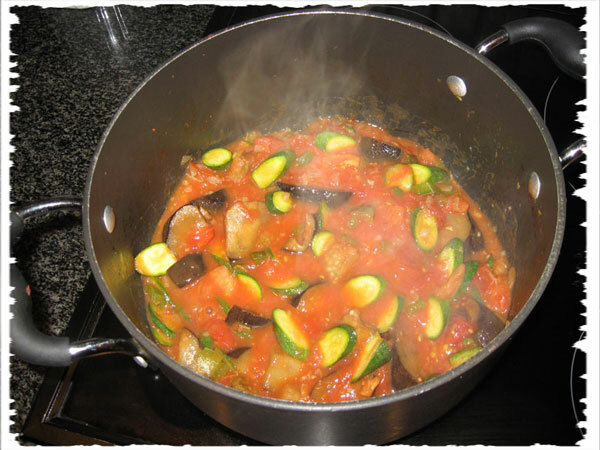 Ratatouille (pronounced (rat-ə-TOO-ee) is a traditional French Provençal stewed vegetable dish, originating in Nice. 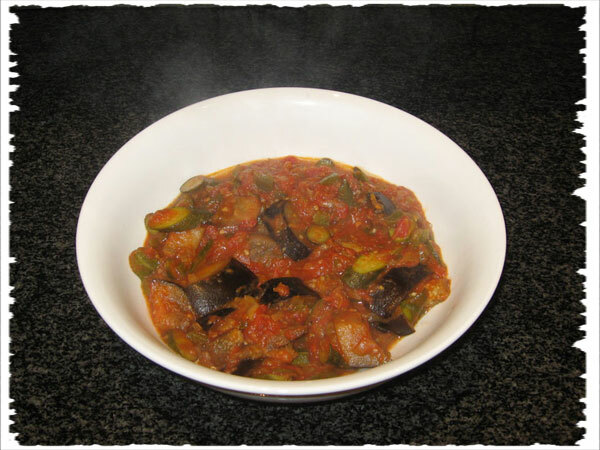 The full name of the dish is ratatouille niçoise. I had recently turned vegan and my best friend’s late mom made me the first vegan dish I’d had that really blew me away. I asked her for the recipe and she wrote it down for me and I’ve been making it ever since. 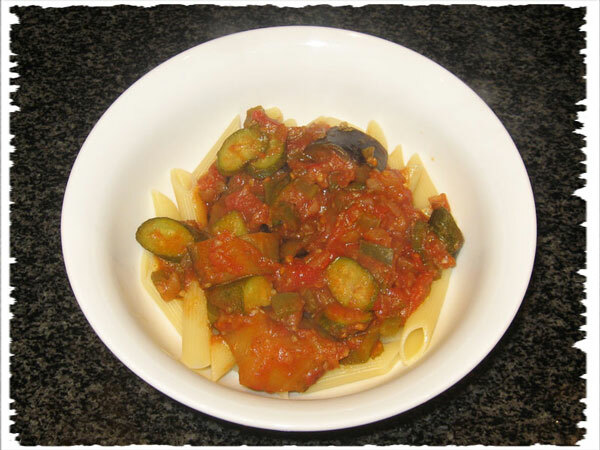 I was only 15 at the time and I knew how to cook but this was the first real dish that I learnt how to make all by myself. I have made my own variations to the preparation but the ingredients are identical. Heat a pot on a medium to high heat for a few minutes and then add the cooking oil. 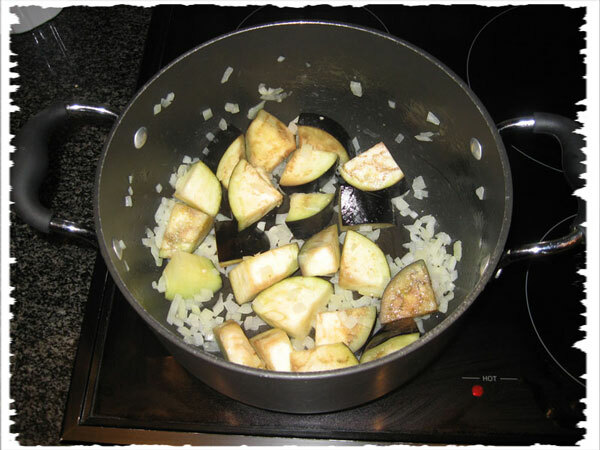 Add in the onions and brinjals and stir-fry for 5 – 10 minutes until the brinjals turn translucent and begin to brown. 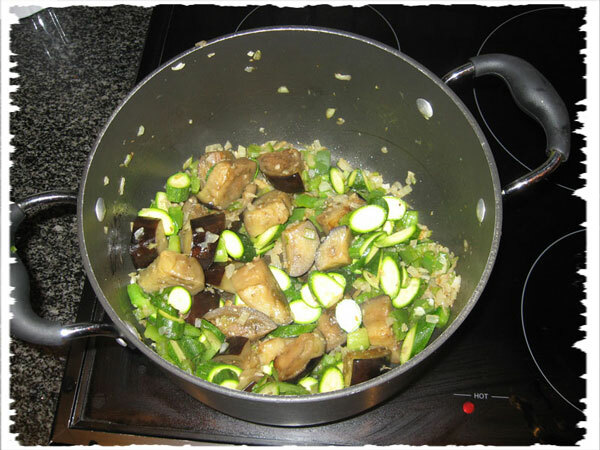 This is the key to the dish – the brinjals become like sponges and soak in the flavours of the other ingredients. Then add in the garlic, herbs, celery and green peppers and sautee for 3 – 4 minutes. Add the baby marrows and sautee for another two or 3 minutes. Add in the tomatoes and stir well and then cover the pot. Leave the lid on for 5 or 6 minutes and stir well making sure it doesn’t stick to the bottom of the pot. Then reduce the heat add some salt and ground black pepper and allow to simmer covered for another 10 minutes or until the tomatoes has broken down. Remove from the pot into a nice serving dish. It can be served in a number of different ways. It is often used a side dish but I feel that’s such a waste if it’s done really it deserved to be the centre of the meal. Serving it as the main course it can be served with rice or roast potatoes. I like to serve it with a good organic penne pasta. What a tasty looking dish! And so significant and meaningful too. I would LOVE to see you’re new kitchen as well!